VU6012962 is an orally bioavailable and CNS-penetrant metabotropic glutamate receptor 7 (mGlu7) negative allosteric modulator (NAM) with an IC50 of 347 nM. LY 379268 is a highly selective group II mGlu receptor agonist with EC50 value of 2.69 and 4.48 nM for hmGlu2 and hmGlu3, respectively. JNJ-40411813, also known as ADX71149, is a positive allosteric modulator of the mGlu2 receptor. JNJ16259685 is a selective antagonist of mGlu1 receptor, and inhibits the synaptic activation of mGlu1 in a concentration-dependent manner with IC50 of 19 nM. 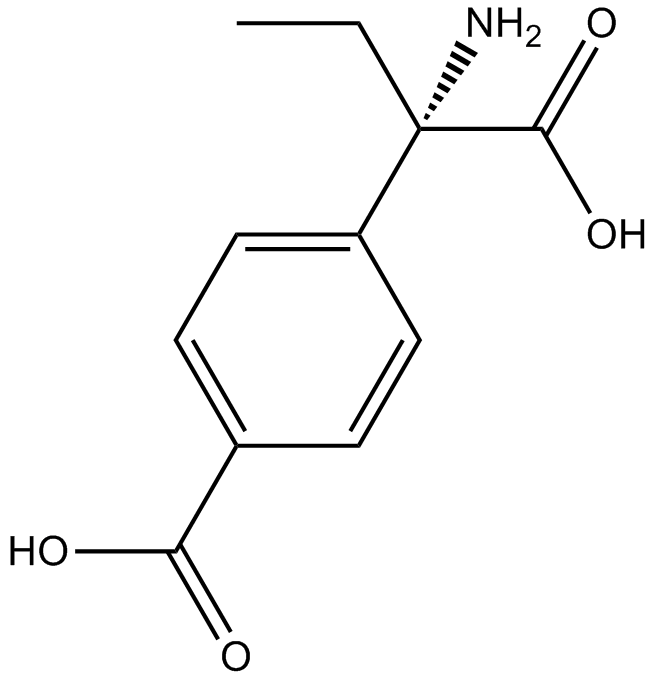 Raseglurant, aslo known as ADX-10059, is a negative allosteric modulator of the mGlu5 receptor and derivative of MPEP which was under development by Addex Therapeutics for the treatment of migraine, gastroesophageal reflux disease, and dental anxiety. LSN2814617 is a potent and selective positive allosteric modulator at the mGlu5 receptor (EC50 = 24 nM). trans-ACPD is a selective agonist for metabotropic glutamate receptors, acting at both group I and group II mGlu receptors. E4CPG is a novel group I/group II metabotropic glutamate receptor antagonist, more potent than (RS)-MCPG .